The Scandinavian countries have a lot of things in common, we are all kingdoms and we’re all democratic countries. We also understand each other’s languages, well more or less. We also like to make it cozy in our homes. We use different words for it, us Norwegians call it Koselig, the Danes use the word Hygge and in Sweden they use the word Mysig. 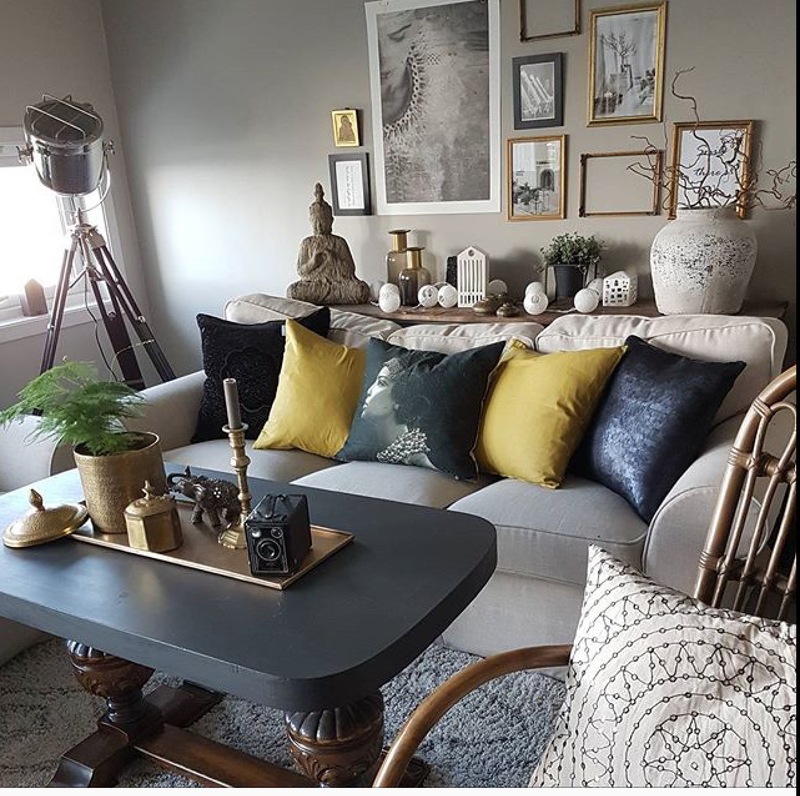 All photos from our home, many of you capsule sisters have asked to see more of our interior. We have a mix of old and new, old antiques mixed with just about anything. My dear hubby is quite handy and has made the console table behind the sofa and also the headboard. As you might see, the interior is changing all the time, just like the weather. I don’t buy very much, I just move things around and change the flowers and the cushion covers. So why is it so important to us all this coziness? It probably has to do with our long dark winters, we need to fill our lives with some Kos to endure the cold and darkness. We put on our cozy pants (kosebukser), we lit our candles, we curl up in our sofas with our cups of tea or hot chocolate and we just make it comfortable and cozy. We put on our woolen socks and homeknitted sweaters and enjoy our homes, which ofcourse are really cozy. Cushions, sheepskin, rugs and candles, lots of candles. Even at daytime we lit our candles. In the middle of the winter we hardly have any daylight at all. Where I live it gets dark at four in the afternoon, further north it’s dark for a couple of months, that means no daylight at all, until the sun comes back in February sometime. In Bergen where I live it’s normally not that cold, but we have a lot of rain and wind, normal temperatures is between 2 and 10 degrees Celsius (35-50 F), but it can also -10 degrees Celsius (14 F) or less for long periods. We just never know, the past winters has been mild though. Some winters we can have a lot of snow, but normal winters we only have snow a couple of days at the time. If we drive for an hour or two we get up in the mountains where there’s lots of snow. Many of us has cabins in the mountains and of course the cabins are as cozy or maybe even cozier than our homes. 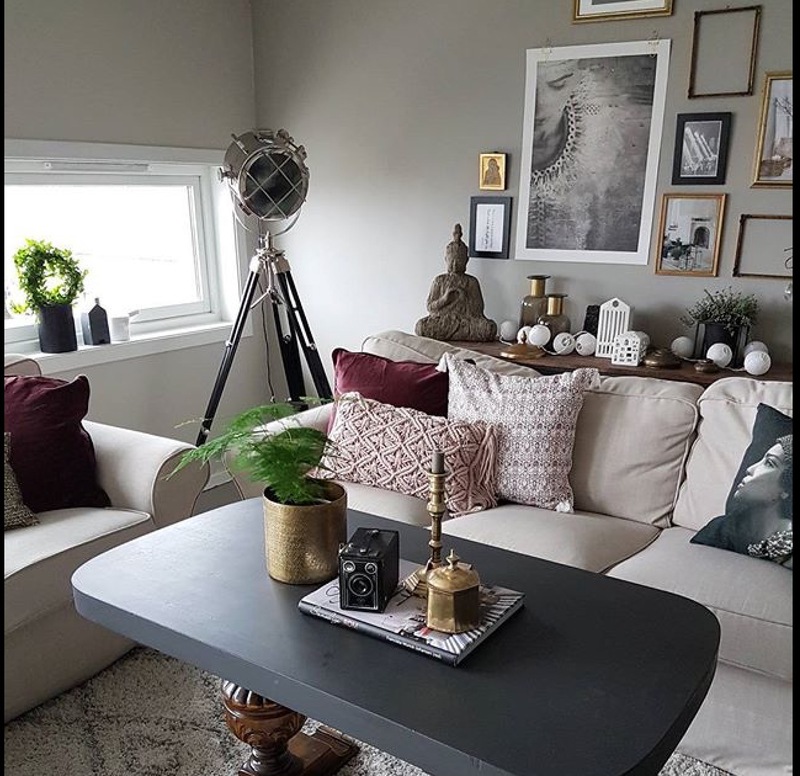 Interior and interior design is important to us, we work on our homes constantly, we paint, redecorate and change style, but most of us need it to be cozy. Even in the most minimalistic home you’ll most likely find a sheepskin and candles, lot of candles. And after our walks, with or without skies, we get home to our house or our cabin, we lit our candles, we sit in front of our fireplace with our sheepskins, in our kosebukser and we drink our tee. We watch sports on TV, cross country skiing, ski jumping and biathlon ( I remember the first time my Chinese daughter in law watched biathlon, she screamed: Omg are they going to shoot each other????) And all the time we have a koselig time, because that’s what’s it’s all about. We need it, we need our candles, our sheepskin, our kosebukser and we need our cozy homes and biathlon on TV. We need koselig. Today we have the remains of the hurricane Ophelia, lucky for us the last of her strength was taken out on Ireland, now she’s just holding a lot of water, and we’re used to a lot of water so it’s really not much difference. Now i I long for the winter, I hope this year we get some real winter. 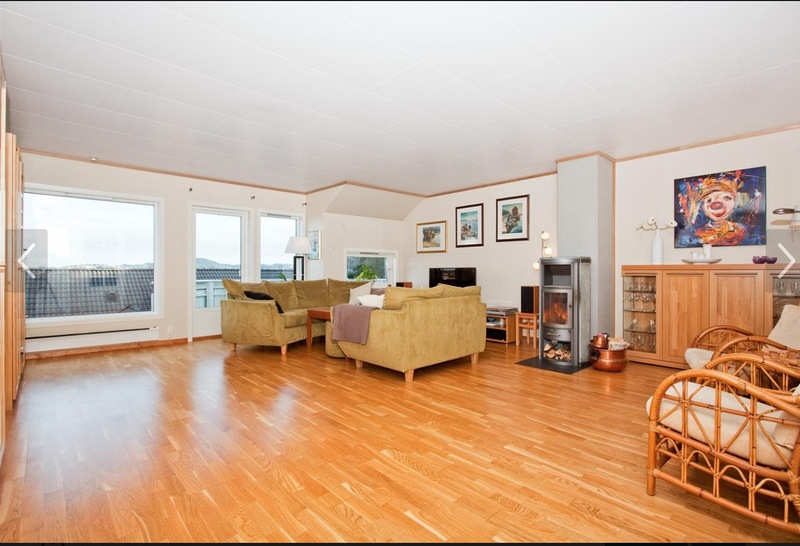 It’s not a Secret that Norwegians are a bunch of homelovers, I think we are one of the countries in the world which use most time and money to redecorate our homes. Maybe it’s because it’s quite cold here most of the year that we need to make our homes nice and cosy, we burn a lot of candles too especially in winter time. I’m no exception on the contrary I use a lot of time and efford to make it nice and cosy in our home, not so much money as I like to see the options in what we already got. A lick of paint can change even the ugliest piece of furniture. When we bought this house about three years ago my hubby believed it was virtually nothing to do here. He was so wrong, one should think he knew nothing about me. The previous owner had painted most of the rooms right before he sold in a magnolia kind of shade. I really not to fond of magnolia and I also find it boring when nearly all rooms has the same color. I can’t relax if I don’t like the colors of the walls, so the day after we moved in I bought paint and started to paint the room we use as a walk in closet. And then I’ve slowly worked my way through the house room by room. Not quite finished yet. The guestroom could do With a makeover and I’m also at the present planning to paint the kitchenwalls some day soon. Today I’ll show you the sitting room, or living room as some calls it. Here’s how it looked when we came to see the house for the first time. Nothing really wrong with it, but not my taste. And we also have very different furniture. This is how it looks now, or not exactly now because at the moment my hubby has carefully rearranged the cushions all by himself. This is how it looked a couple of weeks ago. See how much difference the cushions make. I have a variety of cushion covers and change several times a year. A very cheap and easy way to get a whole new wardrobe expression. Cushions and flowers are like the scarves in our wardrobes, change the scarf and the whole outfit looks different. Today it snowed again here, this spring has really started to annoy me.